Many of us want to lose weight and find ways to save more money. One solution to improve health and save money lies right in our backyards. Home vegetable gardens are great fun, and not as difficult or time-consuming as you might think. We’ll take a look at some benefits and offer up a few tips to get you started. Starting and maintaining a backyard garden is an excellent source of aerobic activity and provides you with vitamin D. It can be a great way to relieve stress, and you’ll eat a more nutritional diet that you’ve had a direct hand in creating. In fact, veggies plucked when ripe from a home garden can provide more nutrients than the store-bought variety, which are often picked before they’re ripe and must travel long distances to get to your table. Furthermore, children who eat fresh vegetables are likely to continue the trend as they get older. Young children are more likely to eat their veggies when they can pluck them directly from the garden themselves. Having a stock of fresh vegetables on-hand can cut down on last-minute trips to buy groceries. If you get home from work only to find there’s nothing in the fridge, you can just step out back, do a little picking, and throw together a quick pasta primavera dish bursting with flavor. Every tomato you eat from your backyard garden is one less you’ll have to buy from the grocery store. Depending on the size of your garden, this could translate into some pretty significant savings, especially if you usually buy organic. If you can handle a larger garden, you could even sell your produce to put some extra cash in your pocket. Growing your own food lessens your carbon footprint as you no longer contribute to the long transport of conventionally grown vegetables. Furthermore, you no longer contribute to the heavy use of pesticides that is typical with conventionally grown produce. Start Small. Don’t go too crazy in the beginning. Set aside an area of about 8 by 10 feet for your garden. Choose Your Location. Pick a location that receives sunlight throughout the day. Analyze Your Soil. Take a sample to your local nursery and share your plans. The experts there will let you know if you’re good to go or if you need topsoil or compost. Choose Your Crop. Some of the easier veggies to grow from seed are peas, onions, and zucchini. For tomatoes or peppers, you may need to start the process indoors, normally about eight weeks before you’re ready to plant outside. Buy Seeds. When it comes to seeds, don’t buy the cheapest available. Even high-end seeds don’t typically run more than a few dollars per bag. You can find top of the line seeds at websites such as Victory Seeds and Gourmet Seed. Plant. Read and follow the individual instructions on the back of your seed packets. Generally speaking, you do not want to plant your seeds too deep. Unless directed otherwise, you usually won’t want to plant them any deeper than three times the length of the seed. Water. Some suggest watering once every day, while others say you only need to water once per week. But what it really comes down to is the climate, the weather, the soil, and the time of year. Keep an eye on your plants – if they start to wilt even slightly, or if the soil is very dry, give them water. Maintain. Watch out for insects, as they can destroy your garden. 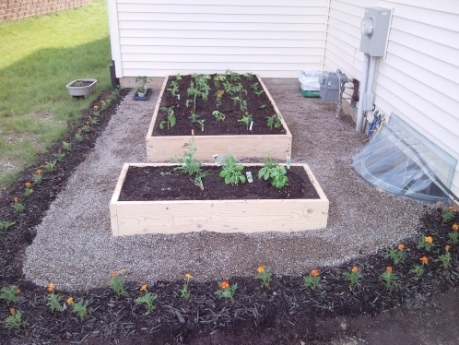 Spacing your vegetables appropriately and weeding can help prevent pests, as can adding fertilizer. If you encounter problems, decide whether you want to keep your crop organic – organic pesticides and traditional insecticides are readily available at most hardware stores. Harvest. There is no set of rules as to when you should harvest, as all vegetables are different and mature according to climate and location. You can get a rough gauge from the back of the seed packet on when plants will be ready. But mostly, you’ll rely on how they look and taste. Once you eat a few, you’ll know just when to pick. Your garden will require regular maintenance, but this can be relaxing or even meditative. Weeding and helping in the garden is also a great activity for children. Grab a good pair of garden gloves for you and the kids and get started; they will love growing, harvesting, and eating food they helped grow. Be sure to water your garden in the morning or evening hours to conserve water. If you have more garden tips for those looking to get started, share the in the comments below. David Bakke lives in Atlanta and is a regular contributor for Money Crashers Personal Finance. In addition to his green thumb, David has a strong interest in topics such as money management, health, and green living. Many seeds that people THINK are not Genetically Engineered are often found to be inadvertently contaminated by farmers and gardeners who DO use GM seeds, which are carried on the wind to near-by organic/natural/non-GM farms and gardens, thus contaminating them. This is why it’s important that seed companies, producers, cultivators, etc., have their seeds tested on a regular basis. It’s not good enough to jus assume or guess that your seeds are Heirloom or not contaminated. Just saying ……. I have young children who love to “help” so we have set up our garden with one bed left unplanted. This is where the kids can dig and play in the dirt with their own garden tools, this keeps them busy and close while I’m working, and when I’m ready to rotate the crops next season, the ground has been weeded and tilled for me! Botanicalinterests.com is also a good site for seeds, and they promise not to use any GMO’s. I was going to order some online but came to find out they carried them at my local retail greenhouse. Do you happen to have any “diy natural” tips on how to deal with slugs? They are a big problem in our garden. Any ideas on how to trap them or get rid of them? We recently got chickens, but we can’t let them into the garden while the veggie plants are still young. Would appreciate any advice you have, thanks! Is your soil organic? Usually organic garden soil doesn’t have grub problems, but if you do your best bet is to increase grub predators – like birds, bats, frogs, snakes and rodents – and use milky spore (Bacillus popilliae) and/or predatory nematodes. The bacteria in milky spore kills the grubs but doesn’t hurt the predators (birds) that eat them, or your plants. Good luck, let us know how it goes. Buy heirloom seeds, not hybrid. You can harvest heirloom seeds and use them next year. Hybrid seeds will not reproduce. Diane is right, buy heirloom seeds! The link to Victory Seeds above is a great resource. Again, love your stuff. Have an awesome day!!! Great tips Abby, thanks for sharing your experience, it will help others! Also, thanks for your support and kind words. God bless. I see you have a border of marigolds. I understand they are good for keeping bugs or critters away from vegetables, but is there any science to the distance between them and the planters? Marigolds have always been part of our garden. We have them to deter tomato hornworms and rabbits. Here is a great article on all the benefits of marigolds in the garden.